Psst! Wearable Devices Could Make Big Tech Leaps, Into Your Ear : All Tech Considered Get ready for a different kind of distraction. Tech experts predict hearables, which you wear in your ear, are going to hit the market in a big way very soon. And they may change the way we behave. 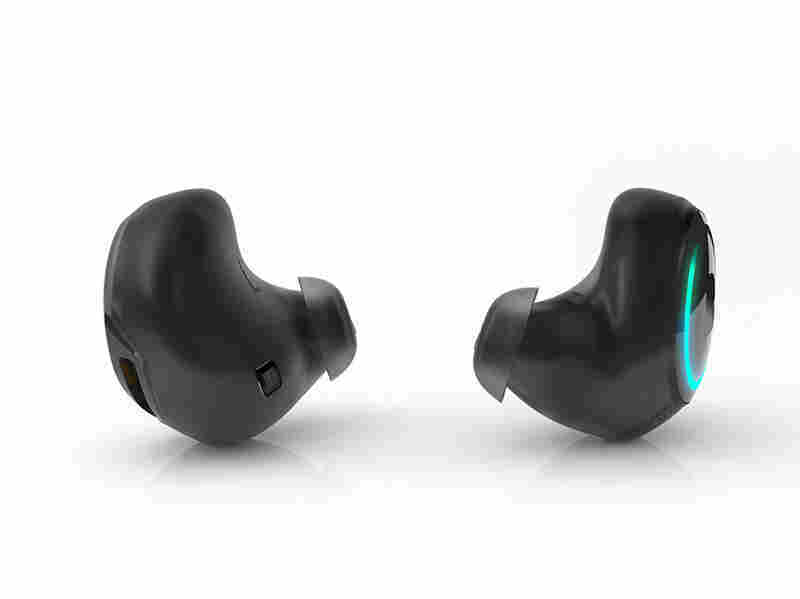 Bragi's Dash, a fitness-centered wireless earpiece, has raised over $3 million on Kickstarter, the crowdfunding site. It's early evening on a Thursday and you're at a networking event, balancing a small plate of appetizers in one hand. Someone comes up to you to say hello. She acts like you've met before, but you can't recall where. "It's Jackie Barnes," she says. "Jackie Barnes," you repeat like you remember. "It's been a while." As you say her name, a little device in your ear picks it up. The device does a search, and microseconds later it feeds you the info it's found on the Web: the college she attended, her current company, that she has two kids and is an avid runner. That's right, she's a former co-worker from a few years back. "How's the new job?" you ask, relieved. Here, in the hyperconnected world of wearable technology, such as Google Glass or Fitbit watches, enter hearables, a small device you wear in your ear. If one forecaster watching this market closely is correct, hearables are about to hit the market in a big way. If that happens, what could this mean for how we interact with the new technology — and with each other? First, let's look at what a hearable could do. There are some on the market, like the Dash, a fitness-focused product from a German company called Bragi. As the technology advances, adoption could become a lot more widespread, wirelessly connecting with your smartphone, for example. "It's discreet in your ear, and it's helping in some way," says Piers Fawkes, president of think tank PSFK Labs. "There's an opportunity for it to be a personal adviser ... whispering going on, giving you directions, telling you that you're late for a meeting." Some forecasters think hearable tech, which you wear in your ear, will outpace the smart watch market. 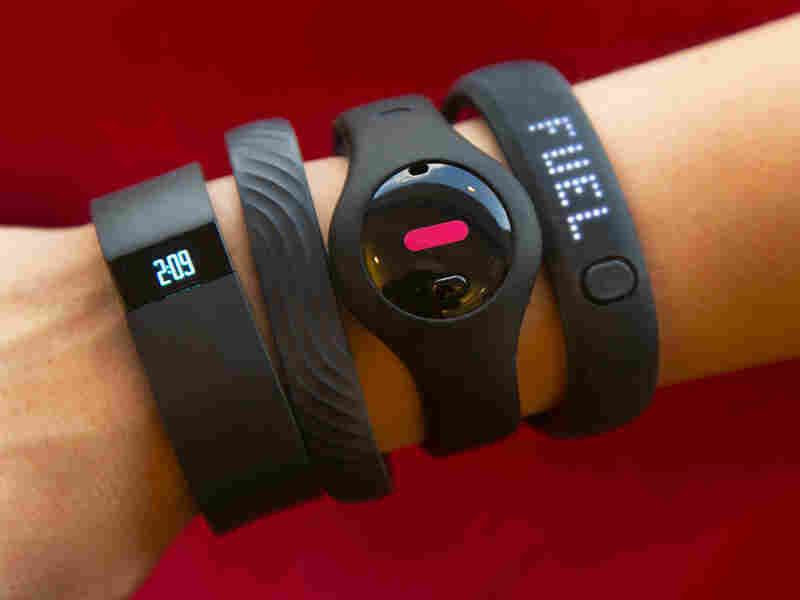 Fitness trackers, from left: Fitbit Force, Jawbone Up, Fitbug Orb and the Nike FuelBand SE. By 2018, hearables could be a $5 billion market, says Nick Hunn, a self-proclaimed wireless evangelist. In a preview of a report he's putting out this spring, Hunn says hearable tech has the potential to outpace other wearables, like watches, in popularity because we already have a wearable device that is socially acceptable and ubiquitous: earbuds. Make them wireless, and it's just a matter of time — and not even that much time, Hunn says. This echoes an October forecast from Gartner that wearables are entering the mainstream market very quickly. The technology is rapidly breaking free from some limitations, such as battery life and bandwidth, Gartner says. Many people — from researchers, to techies, to artists — seem excited about the prospect of what hearables could do for daily life, as well as augmented reality. The wireless in-ear device might give you an alert as you walk past a bookstore that your favorite author is speaking there tonight. Perhaps it picks up the words "this Friday" in your conversation and helps mark your calendar. Or maybe you are on a walking tour of a college campus and as you get closer to certain buildings, audio pipes in with notable research being done at the school. You could do all this without having to bury your face in a screen or looking through Google Glass. We're not too far off technologically, with Bluetooth widely used and improved hearing aids. The lack of a screen or visual element is one of hearables' main attractive features. It helps integrate the device into our lives. "In-ear is more unobtrusive; I can look directly at you as we communicate," says Ben Waber, CEO of Sociometric Solutions. "You want to have access to those things, but at the same time you don't want to interfere with things that people are really good at," namely face-to-face interaction, he says. Even without a visual element, though, hearables still require your attention. How could this multitasking affect social behavior? "What's going to happen, I predict, is that social norms are going to change," says Gloria Mark, a professor at the Department of Informatics at the University of California, Irvine. She studies how people, society and technology influence one another. Mark points out that while we don't really know how hearables will change things, we can look at how people use computers and smartphones to make an educated guess. She is worried about the most attractive feature of hearables, something that makes them both exciting and potentially damaging to social interaction: the devices' seamlessness. You can dip in and out of different functions easier and faster than before. "I argue that people can't really have deep thought about things when you're switching that rapidly," Mark says. In her research, Mark has found that over the past decade or so, people switched between screens faster as the technology makes it easier to do so. In 2012, information workers switched between screens, on average, every 75 seconds. That's up from about every three minutes in 2004. The more we switch, the less we can focus on our surroundings, on people and on work. It could get even easier and faster to switch with hearables, she says. All that switching and multitasking could have real implications for daily life — screen or no screen. Piers Fawkes, from PSFK Labs, foresees one new effect from using a device you don't have to look at. "Maybe instead of people staring at their screens, they are going to be staring off into the distance," Fawkes says. "What's it called? The thousand-yard stare."